Live on the Lawn at Rathmullan House – Live on the Lawn is now SOLD OUT! If you don’t have a ticket please don’t come on the day as we will only be able to admit ticket holders. Two more concerts are soon to be announced so all is not lost!! 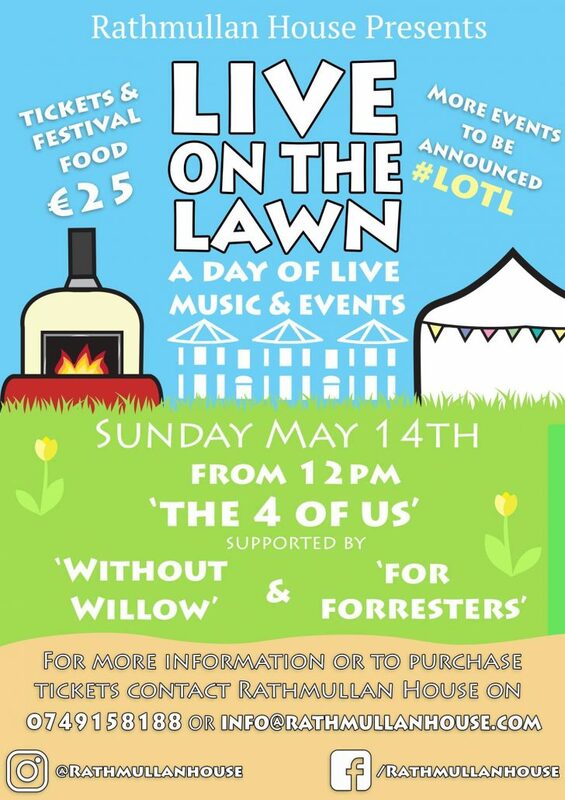 ‘The 4 of Us’ headline our own mini music festival which will run from 12pm on Sunday the 14th of May. During the day, we will have varied activities in the house, on the garden and on the beach to keep everybody entertained between sets. Full details of set times & activities be released over the coming weeks. Tickets for the first major outdoor event of the summer in Rathmullan will cost €25 for the full day. This ticket price includes your festival food from the famed ovens at Rathmullan House. The first 50 tickets sold will be entered into a draw to win a free nights stay for 2 at Rathmullan House on the night of the gig. Tickets will sell out soon so contact info@rathmullanhouse.com or 074 91 58188 to book.